NewsPrints by Ru Xu. 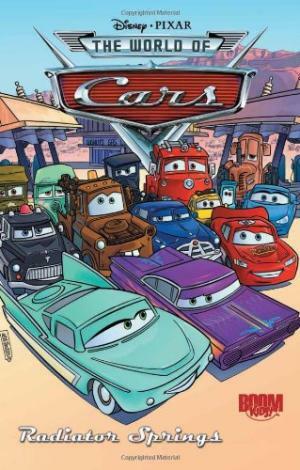 Published by Graphix (Scholastic). ISBN 9780545803120. Published 2017. (Second book comes out Jan 29, 2019.) Target Age - 3rd grade and up. Could be used in higher grades, especially when teaching about WWI, propaganda, and the importance of close reading. This is a new favorite of mine! The fictional story centers around a girl who is a newsboy during a large war. She has to hide her gender as girls aren’t allowed to sell papers and she needs the job to survive as she has lost her parents. Although this is a fictional story, it soon becomes clear that this is an allusion to events in WWI, as evidence through events and images in the book. At first, I thought it might be WWII, but after looking for evidence, it was soon clear that it was WWI as flying was new “Flight is hardly even ready for military use as it is. It’s definitely not for civilians!”. There are other clues sprinkled throughout as well that this could very well be Great Britain during WWI as evidenced in the war propaganda posters and national symbols seen in the background. This is just one way that the reader really needs to pay attention when reading this story, and not just to the words/dialogue. This would be a great book to use when introducing graphic novels in the classroom and close reading/annotating. There is much mystery throughout the story that also forces the reader to pay attention. Subtle clues are given, in both images and text, that are tantalizing throughout the story and keep the reader guessing. Once the larger secret was revealed, I went back to my sticky notes throughout the book and confirmed where the clues were left - well done! 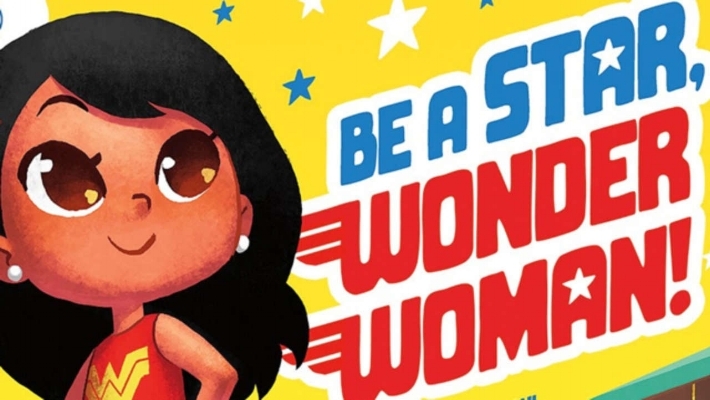 As we strive to make our classroom literature more inclusive, the message of this story is perfect - be true to yourself and follow your passions, even in defiance of those who would force their gender “norms” on us. 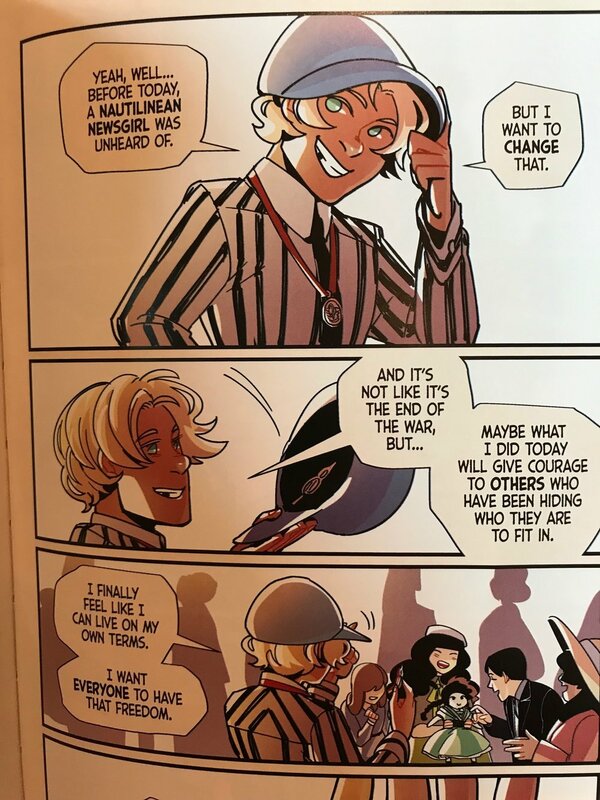 The main character, Blue, not only becomes a female newsboy, but also helps a scientist/inventor with his work, and shows much bravery in remaining true to herself. The story also teaches us that loyalty, friendship, and acceptance of others is so vital to being human. Blue befriends a character named Crow and we are left wondering who he/she is until late in the book. There are clues given to who Crow truly is, but again, you really have to pay attention as an active reader. There is also a questioning of what it means to be human or even considered to be alive - but that would give away the ending of the book… Lots of deep meaning in this book! There is even a part of the story that gets into racial norms as well. Wow. This story is heart-breaking, uplifting, and full of mystery - all while being stunningly illustrated. This is not a book for girls OR boys - it is a magical bridge that not only discusses breaking gender norms, but the author also does it as a book. I would LOVE to write a teacher’s guide for this book as I can see it having such power in the classroom! This story of evolution on earth, oddly enough, begins with beings from another planet who are studying our planet. The Glargalian’s are creating the Glargalian Institute of Earth Evolution and the reader is treated to a behind the scenes story of the studies. Of particular note is Charles Darwin and the Origin of Species to understand this process of evolution. Darwin himself is recreated in this virtual museum to explain his own theories in a compelling and accessible way. We are then introduced to inheritance and genes through Gregor Mendel as the story of evolution on earth continues. The story continues to introduce new scientists and their method of discoveries – truly great insights through a witty and intelligent story. When the reading/ideas get tough, the author has characters ask questions that lead to a small review or other visualizations. This keeps the reader involved and gives brain breaks so that we can more fully comprehend the ideas before moving on. What came first in evolution – DNA, RNA, or proteins? Over the course of a few pages, I was able to more fully grasp how penicillin works – but also why it has become less effective – all through mutations and evolution. The illustrations add to the story and allow the reader to fully comprehend the scientific text. They also add a lot of humor and I found myself chuckling along as I was learning. There are also wonderful one-page asides – such as one on why people believed in dragons, cyclops, and griffins – all based on archaeology and paleontology. At the end of the book, there are great resources for suggested reading and research as well as a detailed glossary. Age recommendation – this book is more 7th grade on up – but younger readers could certainly be exposed to many elements in the book with teacher support. Also – a great way to reach younger students who are more accelerated than their peers. My daughter reads these types of comics all the time - I never used to read them. 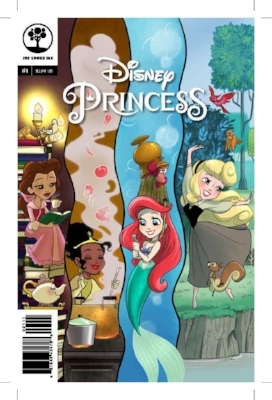 However - this comic was all about how Elsa and Anna made decisions to run the Kingdom of Arendelle. 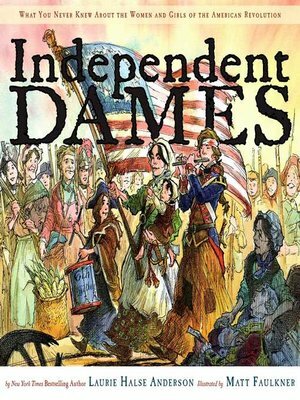 I found it to actually be an excellent way to introduce politics, strong FEMALE leaders, and the need to compromise. I will be reading this series from now on - well done! This is also a perfect example of why you need to visit a local comic book store - titles like these come out all the time! Family has to move because dad got a new job and Maya needs a healthier environment due to her Cystic Fibrosis. A great look into the disease and how the entire family is involved. The usual family stress, sibling rivalry, but then.... black cats, Day of the Dead, ghosts...? Some friendly scary fun throughout the book, but also endearing as a conversation about death is had between siblings. Hispanic heritage and Spanish language also used as a great learning tool. The illustrations are beautiful and engaging. A great book for 1st grade on up. We used this book to open a discussion about death and to answer questions that came up from my children. My fifth grader absolutely loves this book and said many of her friends at school love it as well. It is a story of a 10 year old girl trying to fit in to two worlds - "normal" earth of her father and the supernatural world of her mother. This is something to which we can all relate - what does it mean to be "normal" and to fit in? The illustrations are awesome - there is so much going on in the backgrounds that the reader should take their time. I also loved how the author included higher level vocabulary and ideas - my daughter has always been on a high reading level, but also loves comics. This is the strength of the medium - being able to integrate higher level vocabulary that it accessible through the visual method of storytelling. There are also many literary and historical references included throughout the book. For these reasons, it is tough to give advice for reading levels - I really think it can be from 1st grade on up = each level of reader can get a deeper meaning. This post-apocalyptic tale of invading aliens who feed off of intelligence came as quite a shock to me as a huge fan of Nathan Hale's Hazardous Tales - all history based. I love that the author took hiss same story-telling and illustration skills in a completely different direction and can thrill young readers in new ways. I will be including this in my classroom library and will explain how authors should stretch their abilities and challenge readers. I LOVE this book! It is a story about the Punic Wars - but set on a modern playground. So much history and imagination in this beautifully illustrated book! I can't put a grade level on it as I can see using it in all grades. High school students could read this and be asked to create their own kids comic on a historical topic to be shared with younger students. What makes this even better, is that the author is a former history teacher turned stay at home dad and author!!!! Within the first chapter, the reader is already posed with some rather deep questions – who are we? Where are we? Who is God? What is outside our ability to see? How do we go about proving what truly exists? Is the Old Man God or just a human with some talking parasites? Are the organisms alive in/on our bodies sentient? Why do Follicle Mites not have butts? If we scratch ourselves, are we vengeful gods? Do Mites have a system of religion? Why do I exist? “Hey! That sounds like a testable hypothesis” – this is an all-ages comic and testifies to the power of the medium – graphic novels and comics can be used on so many levels. The visuals make the text all that more accessible and yet challenging at the same time. The illustrations are warm and approachable – they make the scientific theories discussed relatable and even human. There is much humor throughout the book – I found myself chuckling often on many levels. The remainder of the story delves into the experiences of Charles Darwin and his scientific expeditions. It was an enjoyable way to get inside of Darwin’s head and to understand him as a thinking person – not some scientific god on a pedestal. I often stopped reading to look up information on the internet – the author often inspires further research. I learned a lot from this book and see it as a wonderful addition to a social studies, philosophy, or science classroom as either an introductory text or as part of a research paper/project. The ending of the story gets into weak points of Darwin’s theories and becomes a powerful reminder of his own struggles and doubts. The book leaves the reader with questions, just as it began. This is not a scientific tome where the theories are treated as simple facts to be studies, but rather, an ongoing process to understand ourselves and our existence. There are also many pages of author annotations and a bibliography at the end of the book. This is an amazing series by First Second books - titles are also on Coral Reefs, Dinosaurs, and Volcanoes. My own children love them and I can see them being a great fit in all levels of classrooms. Wow! Read this after Smile and loved it so much! My first grader read it first - she was cracking up laughing at so many parts of the book - my fifth grader had the same reaction. When I read it, I was amazed at how it was such a perfect book for all of our reading/maturity levels. I Was able to connect with this story in so many ways as both a parent and a one time child myself. This book deals with serious issues (sibling rivalry and even husband/wife marital complications noticed by the children) but in a personal and accessible manner. The illustrations pulled at my heart on many panels and helped me (and my children) to connect to the story. Wow. my 1st and 5th grade daughters went crazy when this book arrived in the mail today. They told me it was one of the most popular books in their library. I read it and, wow! - now I know why. The content is more for 5th-8th grade, but many ages (including mine) can relate to the awkward growing up drama told in this beautifully illustrated graphic novel. Even though this autobiographical story took place some time ago, it is intriguing to understand that we all go through so many of the same issues. I was even able to have an honest conversation with my daughter about some of the issues in her life and her fears of moving onto middle school next year. This is a must have book. One way we were able to hook my "reluctant reader" son. Oh - you like to watch this series on TV? How about we read about it... These types of comics get kids into the comic book store (and "regular" book stores) and excited to read. He graduated from these monthly titles to the collected books - it was an intro to reading chapter books and helped give him so much confidence as he explained the stories to us.